I cannot fathom that it is already the end of July. Summer is whizzing by. They always talk about how kids these days are overscheduled; I think the same goes for adults. Community and work commitments have kept me zooming here, there, and everywhere - everywhere except my kitchen that is. I had grand plans for dishes I would make this summer, and so far, that list remains fairly untouched. Last night was one of the first nights that we were going to be home, had no other plans, and weren't completely exhausted. I was able to take a deep breath and create a light summer meal at a relaxed pace. 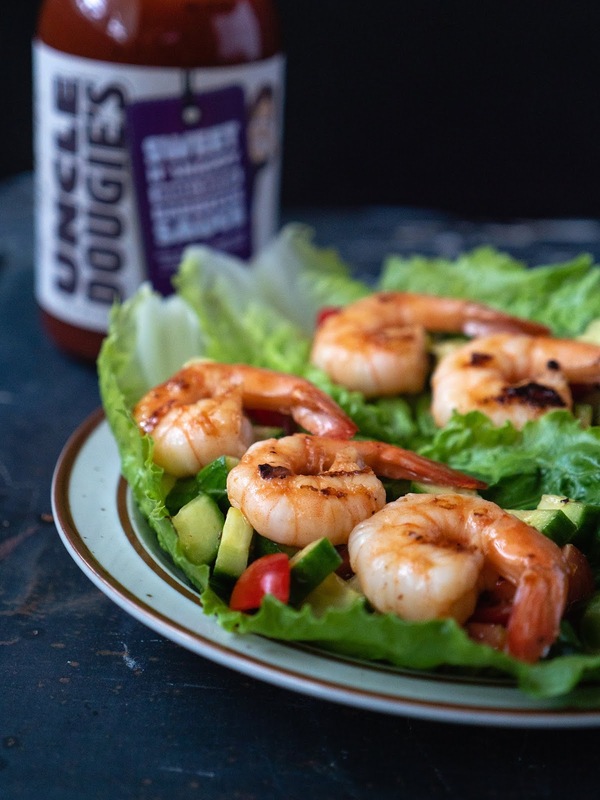 The result was these grilled shrimp with a sweet, tangy BBQ sauce on a bed of cucumber, tomato, and jalapeno served in romaine lettuce leaves. Uncle Dougie's Sweet 'N Snappy Small Batch Barbecue Sauce from this month's Degustabox brought it all together. I like the "Uncle Dougie’s No-Crap Commitment." The sauce is gluten-free with no artificial anything, no high-fructose corn syrup, no MSG, no chemicals, no preservatives and no GMOs. The Sweet 'N Snappy is very mild but has a nice flavor. I'm definitely interested in trying one of their bolder, spicier flavored sauces. 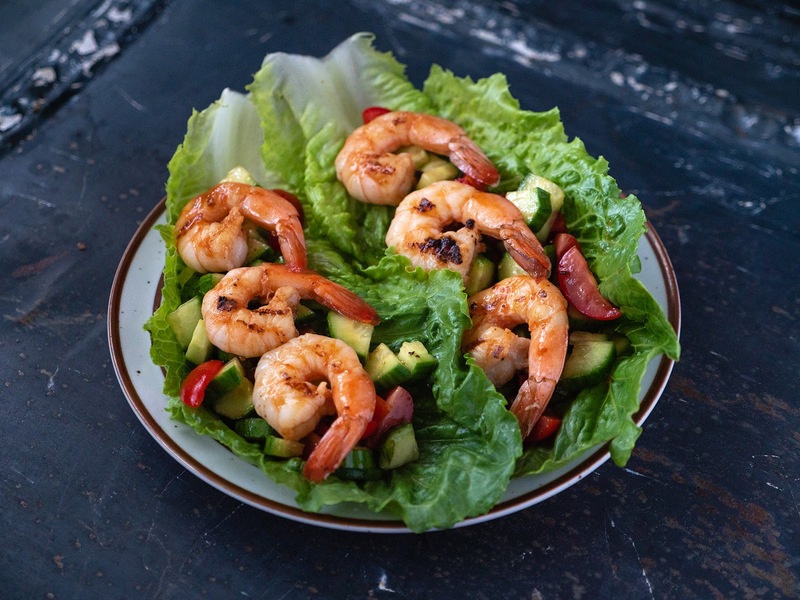 I served this refreshing summery combination of BBQ sauced vegetables and grilled shrimp in romaine lettuce leaves. It was refreshing for a humid summer evening. It was filling while not weighing us down. It was healthy without making us feel like we were missing something. And, maybe most of all, it might have come together quickly, but it wasn't rushed and we were able to savor every bite. It's a simple meal. Sometimes we need simplicity in our lives. We need quiet, slow-paced moments where we can connect to not just our food but also ourselves and each other. This meal did more than feed our bellies. In a medium-sized bowl toss together the diced cucumber, quartered cherry tomatoes, minced jalapeno, a pinch of salt and black pepper, and 2 tablespoons of the BBQ sauce. Divide the mixture evenly among the four romaine lettuce leaves. Set aside. In a separate bowl toss the shrimp with the remaining tablespoon of BBQ sauce. Grill the shrimp over medium-high heat until fully cooked (pink and tightly curled). 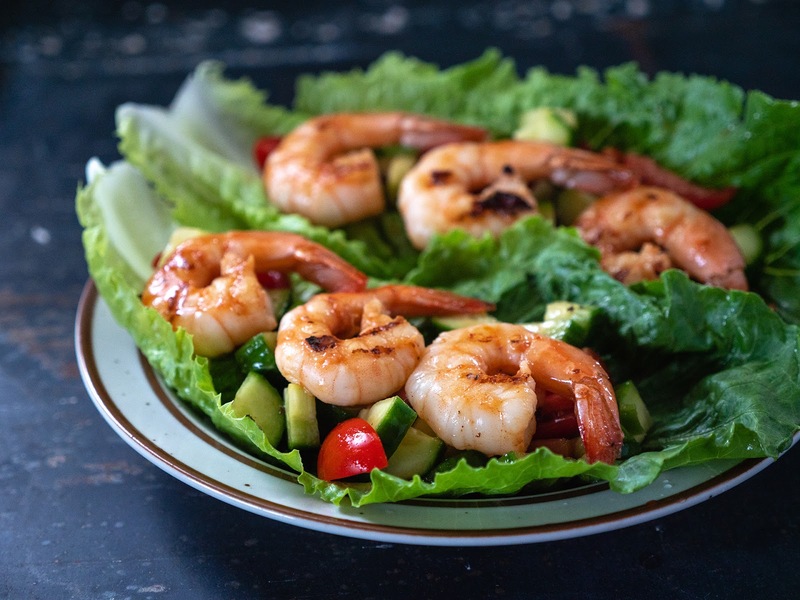 Place three shrimp on top of each vegetable filled lettuce leaf and serve immediately.